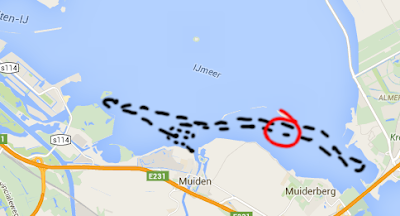 In the winter of 2014 I tried a small crossing from east-IJburg (Amsterdam) to Almere. I actually made the whole crossing. At that point of time I did use my normal GPS-speedsurfing kit (razorsharp fin, SDM mast, etc.). It all went fine and I had good speed, didn't have a GPS anymore but it was fun anyway. At Almere beach I did my gybe ant went back. It was soo easy, already I thought lets do this twice... However back at the islands a few trees took away my wind and I fell in the water. This was not dangerous, however it was quite cold and I wanted to waterstart immediately. Just above my right knee I touched the fin, and it felt strange. Once on the board I saw a large cut in my winter wetsuit, suddenly it felt like my leg was loosing blood. However I couldn't drop the sail, because no uphaul rope... I decided to 'quickly' sail back and check the damage at the beach. Those were the longest kilometers I have ever crossed. All the way I kept thinking, stay calm, low heart beat.. But my body was full adrenaline. Have a small EHBO kit.